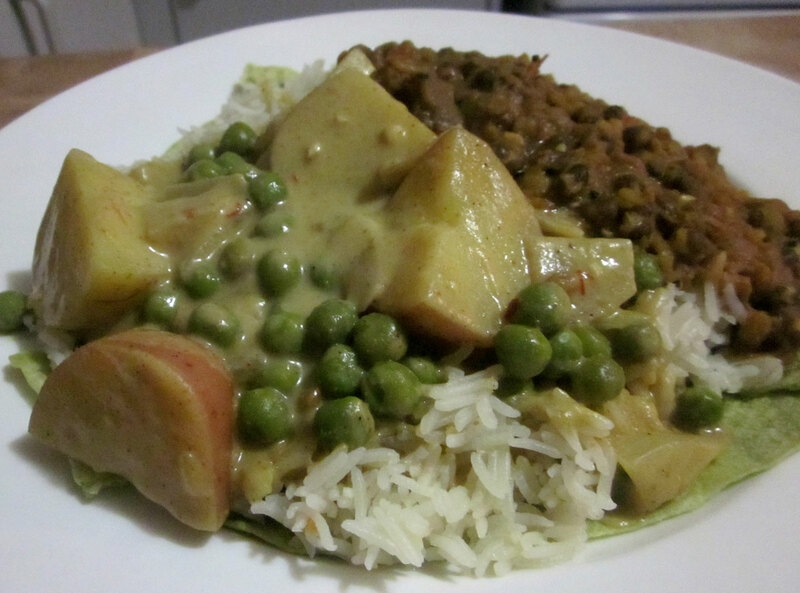 I’d been wanting to do something interesting with the coconut yoghurt we’ve been buying, and Steve had made a yummy dahl, so I decided to make a curry with a yoghurty sauce, something I’ve never made before. I looked at a couple of recipes for inspiration, and then set to it. Being coconut yoghurt, the result was certainly very coconutty, which for us wasn’t a bad thing. If you’re not keen on coconut you could try a more plain tasting yoghurt but I imagine it would be a very different result. Plain soy yoghurt is very hard to come by around here, but I will try it one day and see. Despite the longish list of spices this really is quite quick and easy. Heat the coconut oil in a pot, then add the onion, garlic, ginger and chilli. Cook for a few minutes until the onion is softening and translucent. Then add the rest of the dry spices: fenugreek seeds, cumin, coriander, turmeric and garam masala, and cook for another couple of minutes. Add the besan flour and stir through, cooking for about a minute. Then add the veggie stock and bring to the boil. Reduce the heat and add the yoghurt. Stir it all through until it’s well combined and then add the potatoes and paprika. 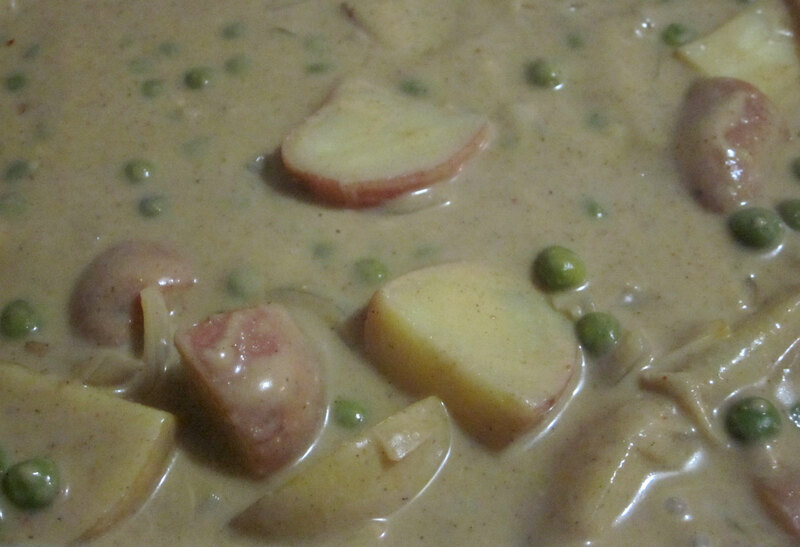 Cook on a low heat until the potatoes are finished cooking and then add the peas. Cook for a few more minutes until the peas are tender, and then it’s ready to serve. We had it with rice and dahl. This is great! I have coconut yogurt in the fridge that needs using up. It will be going into my next curry sauce now. Thanks!